Normal sinus rhythm with normal QRS morphology. 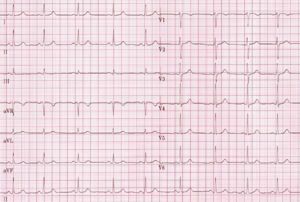 Are there any pathological Q waves as a sign of previous myocardial infarction? Are there signs of left or right ventricular hypertrophy? Does the QRS complex show microvoltage (roughly QRS < 5mm)? Is the conduction normal or prolonged (QRS-interval > 0,12s)? Is the R wave propagation normal? Normally R waves become larger from V1-V5. At V5 it should be maximal. If the R wave in V2 is larger than in V3, this could be a sign of a (previous) posterior myocardial infarction. Other causes are noted in the chapter Clockwise and Counterclockwise rotation. If all these items are normal you can go on to the next step: ST morphology. This page was last edited on 24 January 2010, at 16:05.